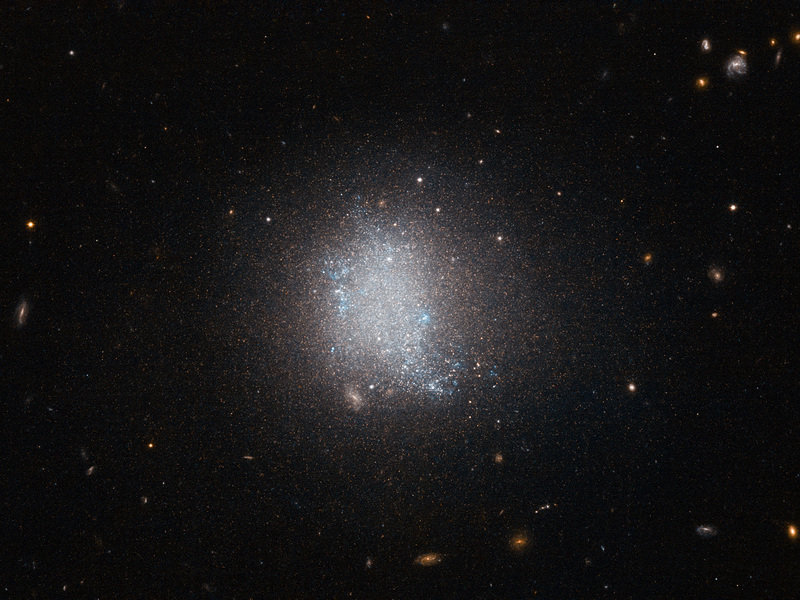 The smudge of stars at the centre of this NASA/ESA Hubble Space Telescope image is a galaxy known as UGC 5797. 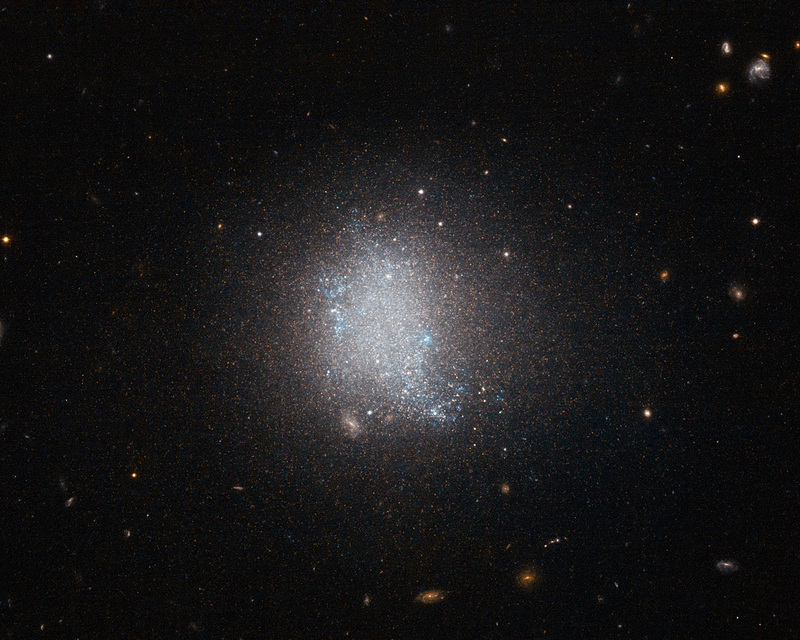 UGC 5797 is an emission line galaxy, meaning that it is currently undergoing active star formation. The result is a stellar population that is constantly being refurbished as massive bright blue stars form. Galaxies with prolific star formation are not only veiled in a blue tint, but are key to the continuation of a stellar cycle. 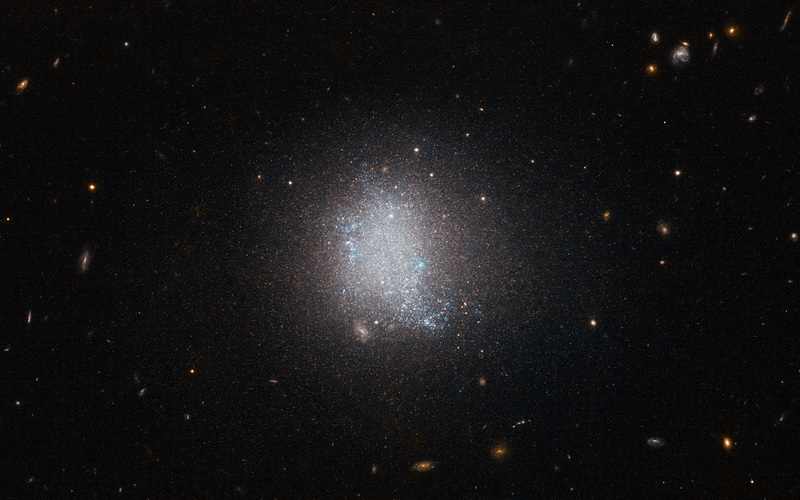 In this image UGC 5797 appears in front of a background of spiral galaxies. Spiral galaxies have copious amounts of dust and gas — the main ingredient for stars — and therefore often also belong to the class of emission line galaxies. Spiral galaxies have disc-like shapes that drastically vary in appearance depending on the angle at which they are observed. The collection of spiral galaxies in this frame exhibits this attribute acutely: Some are viewed face-on, revealing the structure of the spiral arms, while the two in the bottom left are seen edge-on, appearing as plain streaks in the sky. There are many spiral galaxies, with varying colours and at different angles sprinkled across this image — just take a look. A version of this image was entered into the Hubble’s Hidden Treasures image processing competition by Luca Limatola. Position (Dec): 1° 43' 8.08"